Smooth roadway with bike lanes and little motor traffic. This ride starts at Genoa, but can also begin at the Foothill/Kingsbury intersection. As the name suggests, this ride is along the original Pony Express route on the Emigrant Trail – traveling from the Genoa/Mormon Station to the Woodfords Station (SR206). 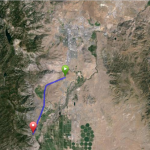 It is a popular road bike ride among locals because of its low traffic volume, quality pavement, and views of the fertile Carson Valley, and the majestic peaks of Job’s Peak (10,633’), Job’s Sister (10,823’) and Freel Peak (10,881’). Freel Peak is the highest peak in the Tahoe area and the southern-most extension of the Carson Range. You will ride along Foothill Rd. and turn right on Fredericksburg Rd. Continue southbound and turn right on Emigrant Trail and ride until it reaches Hwy 88 where you will turn right to the Woodfords Station. 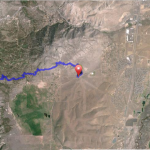 Ride Options: Diamond Valley Loop and Emigrant Loop. You can ride this route nearly all year long. Foothill Rd. was the Carson Route of the California Trail that served as the path for the Pony Express and the Emigrants traveling to and from the gold fields on the western slope and silver mines on the eastern slope of the Sierras. Some of the emigrants who did not strike mineral riches settled here in the fertile Carson Valley to grow feed for dairy cows, cattle and sheep that supplied the growing populations at the mining areas. (Additional history can be read at Diamond Valley Loop and Emigrant Loop rides).